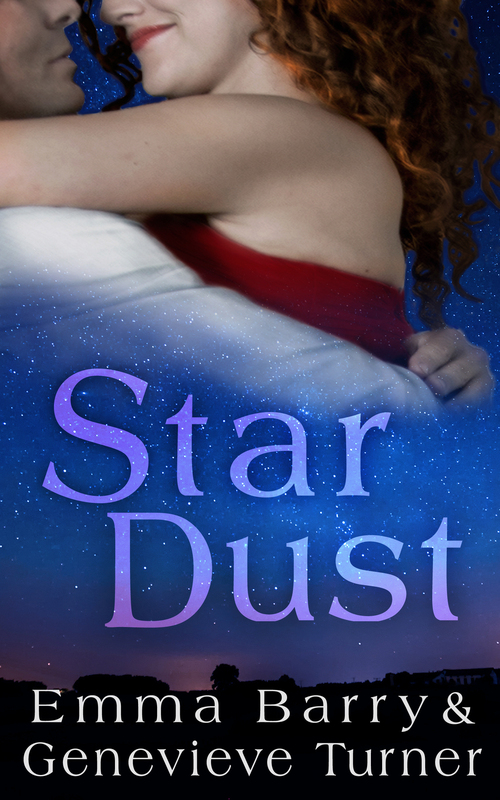 First things first, Star Dust is here! It’s available wherever fine ebooks are sold, including Amazon, iBooks, B&N, Google Play, and Kobo, and you can even order a paperback at Amazon. It’s a space-race rom-com about a divorcee looking to start a new chapter and an astronaut reaching for the stars. I truly love this book, and I’m not just saying this because Gen and I had so much fun writing and editing it (though we did). But if you’ve been enjoying these retro food posts, you should give it a try. To celebrate Star Dust’s launch (I had to, y’all, I had to), here’s the one you’ve been waiting for: Grape Jello Salad. I’ll go ahead and repeat what I said about the Orange Moss disaster: read Elisabeth Lane’s post about a peach Jello mold, which was inspired by this recipe at The Kitchn, and the archives of The Jello Mold Mistress of Brooklyn. Also, given a choice, go for an aluminum Jello mold over a plastic one. The trickiest part of this thing was getting it out of the damn mold. But once I did, it was quite pretty. Bring the white grape juice to a boil in a saucepan. Sprinkle the gelatin over the water in a large bowl and allow to dissolve (approximately 3 minutes). Add the boiling juice and stir until the gelatin is completely dissolved. Whisk in the red grape juice. Refrigerate for one to two hours, until the mixture begins to set around the edges (a spoon should definitely leave an impression). Whisk the partially set Jello until it’s uniform texture (resembling thin pudding). Pour a small amount into the bottom of a 6-cup Jello mold and then add the apples. Press the fruit into an indentations in the mold. If you want a clear delineation between the fruit layers, chill for 10 minutes before continuing. Stir the grapes into the remaining Jello and gently ladle it over the apple/Jello mixture. Cover the mold with plastic wrap and return to the refrigerator to set completely (at least 4 hours). You can make the Jello up to three days in advance. To unmold, fill a large bowl with warm water. Hold the mold in the water for 15 to 20 seconds. Invert it over a plate and shake. If the mold won’t loosen, repeat this step. As a last resort, run the edge of a knife around the edge of the mold before inverting it onto the plate. This one worked exactly as advertised. It took about 1.5 hours to get to the jell stage. I did not chill it in between the apple and grape layer, so everything ended up mixed together (ironically, the grapes sank and the apples floated, so my layers sort of flipped), but it was still pretty. The main problem was getting it out. 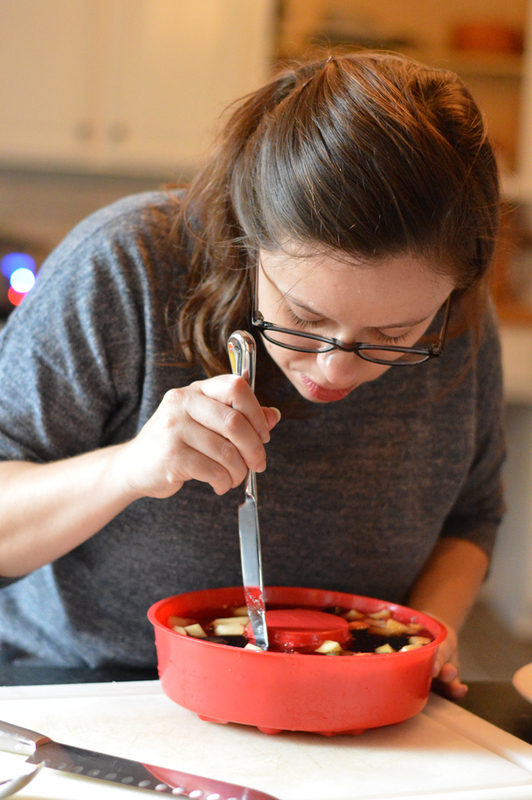 Since I know Elisabeth will be annoyed if I don’t use one of these, here I am running the knife around the mold. To get the full impact of this photo, you’ll have to imagine me muttering profanity under my breath. But eventually the Jello came out. And it was eaten. And it was actually pretty good. 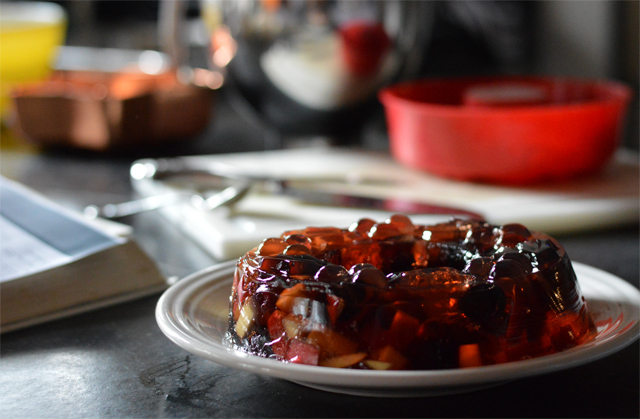 Jello isn’t the height of sophistication in 2015, but it’s easy and cheap. If you use a recipe like this one that relies on fruit juice, it doesn’t have much added sugar and there’s no fat, making it the healthiest of the 60s recipes I tried. At the very least, it’s a pretty, colorful centerpiece for your retro dinner party and of all the things I made during this project, this was the one my kids enjoyed the most. Tomorrow, we have our finale: a decadent fudge! My eternal gratitude goes to Elisabeth Lane from Cooking Up Romance for her assistance. If you hold a hot, wet kitchen towel around the jello mold for 3-5 seconds before tipping it over, most of the time it will emerge easily and intact. 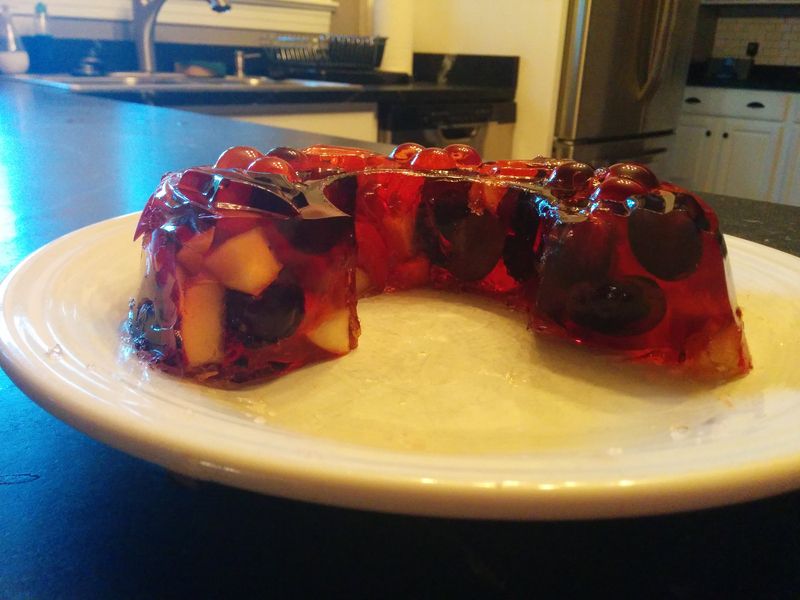 Don’t overdo it or the jello will start to get runny. Very pretty and looks tasty, too! Oh, that’s a good idea. This one was pretty stuck. I don’t think anything other than the knife would have gotten it out. But I’ll try that next time (and there will be a next time because my kids liked it; ha! ).